​A monk asks the Zen Master what it's like to be enlightened? The Master says: "Nothing special. It's just that when I fall down I get up again." At each moment of our lives we are born again. Just as every day is a new day, so every moment is a new moment. Our selves are the moments of our lives. This fact does not contradict the fact of inter-being (pratitya-samutpada). No moment is an island. Each moment is a coming together - a concrescence - of the entire universe. We are these concrescences, these gatherings of many into one. Thus we are not simply ourselves; we are also the universe becoming itself through us. And so is everyone else. In the face of the other person the universe appears to us, not as a cosmic consciousness but rather as that person in his or her individuality. Jeff and Jane, Mei and Zhihe, Jose and Maria, Vladimir and Anna, Muhammad and Adiba -- all are the universe presenting itself. All of these presentations take place in the only time we really have: the present moment. Now and then we have tastes of this. We feel the radical inter-being which is the essence of who we are and who others are. None of this belies our individuality. No two moments are same, and no two people are the same. Even as we are composed of other people and the more-than-human world, we are self-creative in how we respond. This self-creativity is our true self. "When I fall down I get up again." In Whitehead's philosophy as in Zen Buddhism, the human self is not a solid entity that endures unchanged over time, but rather a series of moments of experience, each of which has subjective immediacy as it occurs. Whitehead speaks of such a moment as an actual entity. An entity is not a "thing" but rather a happening, an event, an occasion in time. Subjective immediacy is the internal aliveness of the actual entity as if unfolds: its combination of self-enjoyment and self-creativity. Self-enjoyment is the feeling the entity enjoys or suffers as it happens. Self-creativity is an act of decision, conscious or unconscious, that the entity makes, concerning how it will constitute itself out of past influences. The entity chooses from among various options for integrating influences from the past; its decision is how the many become one. In human life we call this freedom. Partly Free and Partly Determined: Together, both the self-enjoyment and the self-creativity are the actual entity as a reality for itself, its immediacy. The entity at issue may be 99% determined by past influences, which in human life can include bodily, social, and historical influences and, for Whitehead, divine influences (a lure for positive feeling and self-creativity). But even as 99% determined, the entity is 1% free. This 1% is its self-creativity and even God cannot override it. Karma: After it happens, the actual entity loses its immediacy. This loss is everywhere apparent; it is the universality of what Whitehead calls perpetual perishing. A Buddhist will call it impermanence. When the moment loses its immediacy in the ongoing life of a human being, the moment becomes past and a new moment takes its place. This loss is not the perishing of the moment as such, but rather the perishing of its immediacy, after which the moment becomes an influence in the future. In Whitehead's language, the moment becomes objectively immortal, affecting the entire future of the universe one way or another. This is how a Whiteheadian would understand karmic connections with the past. Consciously and unconsciously, we are influenced by everything that has happened in the world and in the universe. We are karmically connected, positively and negatively. The lure of God is toward the elimination of negative karmic connections (greed, hatred, and ignorance) and the cultivation of positive karmic connections (wisdom and compassion). The lure of God is that we become bodhisattvas, each in our way. ​When one attains enlightenment in Zen Buddhism, at least two things are realized. First, one realizes that the deepest level of one’s life -- what in Zen is called the "true self" -- is always here-and-now. And second, one understands that this true self, even though here-and-now, is always changing. The aim of this essay is to interpret these insights from a process perspective and thereby illuminate certain aspects of the human self. The essay is not about Zen alone, or the self alone, but both. For the true self discovered in enlightenment is the ordinary self or "everyday mind" of each and every human life. (ZDPR 31). Yet, as Zen well attests, this everyday mind has unique qualities which contravene customary ways of thinking about selfhood and reality. In what follows I hope to explain some of these qualities and the everyday mind to which they belong. In process philosophy the life of a human being is viewed as a series of experiences extending from birth (and perhaps before) to death (and perhaps after). Each experience in this series is a subjective process of feeling many data and synthesizing them into a complex experiential whole. When the synthesis is complete, the immediacy of the experience perishes, and the experience becomes an object to be remembered consciously or subconsciously by subsequent experiences. As an object remembered, an experience is a superject. As an immediate process of feeling and synthesizing, it is a subject. To say that a human life is a series of experiences, then, is to say that such a life is a series of subjects which become superjects for subsequent subjects. In this essay the word "person" will refer to a particular series of experiences extending from physical birth to physical death considered as a whole. The word "subject" will refer to any experience in that series, insofar as the experience is a process of feeling and synthesizing data. And the word "self" will refer to that particular subject in the ongoing life-history of a person which is present rather than past or future. Thus a person is a series of subjects, and a person’s self is the subject which at any given moment is here-and-now. When a particular subject that is here-and-now perishes, it loses its status as the self of the person at issue. The subsequent subject takes its place. Thus a person’s self consists of a different subject at each moment, but at any given moment the self is here-and-now. The self as just defined is the "true self" or "everyday mind" of Zen. When one attains enlightenment in Zen, the reality of this self is uncovered in an intuitive and nondiscursive way, and it is seen that this self is both always here-and-now and always changing. This realization marks the beginning of a new way of experiencing based on the reality of the self. Inasmuch as the self is always here-and-now, one lives fully and creatively in the present. Inasmuch as it is always changing, one realizes the impossibility of clinging to any particular moment of the self’s existence. In a certain sense, the self is a groundless ground. It is a ground because it is the point of departure for all activity in the world, and it is groundless because it is never the same at any two instants. One cannot cling to one’s self; one can only be one’s self at each moment. As Ummon put it: "When walking just walk, when sitting just sit, above all, don’t wobble" (ZDPR 5). If we are to understand the true self, though, we must recognize that there are two perspectives from which it can be viewed. One is a third-person perspective; the other is a first-person perspective. In Zen the first-person perspective is always preferred. The enlightenment experience itself is an uncovering of what has always been present from a first-person point of view. A dialogue between Zen and process philosophy must therefore involve a recasting of the ideas of process thought in first-person terms. In order to illustrate the difference between a third-person and a first-person perspective, imagine swimming the length of a pool. If in your mind’s eye you picture a body crossing a pool from one end to the other, then you are assuming a third-person perspective. It is as if you are a spectator on the side of the pool watching a body as it moves from one location to another. If, on the other hand, you imagine yourself inside the body of the swimmer, such that your arms are moving in front of you and water is splashing at your sides, you are assuming a first-person perspective. Both perspectives are of course products of the imagination, but one involves imagining experience from the outside, whereas the other involves imagining it from the inside. While the first-person perspective is preferable in a dialogue with Zen, the third-person perspective also has its merits. Through it, for example, we can easily picture the referents of the term "self, person," and "subject" as they have been defined. The act of swimming the length of a pool can be taken as a metaphor for human life. The side from which one dives into the pool represents physical birth, the side toward which one swims represents physical death, and each stroke of the arm represents an experience on the journey from birth to death. The person would be the series of strokes considered as a whole. A subject would be any and every particular stroke, regardless of whether it is past, present, or future. The self would be that subject which at any given moment is in a process of occurring. The self would be the first stroke of the arm as it occurs, then the second as it occurs, then the third, and so forth. Thus while a particular subject is stationed in a particular region, the self moves from region to region, traversing the length of the pool, aiming toward death. Approached from this third-person point of view, the image of a swimmer swimming is helpful in picturing the self in relation to the person and to the subjects constituting the life-history of the person. The self is on the cutting edge of a person’s life, being-toward-death. Yet a third-person approach is problematic because it tempts us to think of our respective selves as something other than who we are. The self appears as a mere image or object in our mind’s eye, an abstraction. In order to counter this limitation of the third-person perspective, it is necessary to imaginatively assume a first-person point of view. We must leave the side of the pool and dive in, and thus become the swimmer swimming. To dive in is to enter the domain of the self in its own element, the element of lived experience. It is also to enter the domain of Zen. One’s true self is whatever one is doing or undergoing, as one is doing or undergoing it. As I type words on paper, for example, my self is the typing. As I gaze out the window, my self is the gazing. As I drive home from work, my self is the driving. As I eat dinner, my self is the eating. And as I sleep, my self is the sleeping. Your self at this moment is reading the words on this paper. In lived experience, the ongoing process of doing and undergoing is a process of experiencing the world from a subjective point of view. One’s subjective experience is not something others can observe, and yet it is constantly occurring as the very essence of one’s process of existence. The word "doing" points to the active side of subjective experience and to the bodily actions that issue from that active side. The word "undergoing" refers to the receptive side of experience, to that side of experience in which the world is experienced as given fact. At this moment, for example, you are experiencing the ink marks on this page as given facts. This aspect of your experience is the receptive side. Yet you are interpreting their meaning and responding to them, which is the active side of your experience. Almost al lived experience involves both an active and a receptive component, an aspect of doing and one of undergoing. Process philosophy helps us unpack the essence of experiencing still further. Hartshorne and Whitehead suggest that one’s subjective experiencing is a process of synthesizing the data of experience into an aesthetic whole by perceiving them (the receptive side) and responding thereto (the active side). To perceive data is to "feel" them, to take them into account subjectively. From the perspective of lived experience, the data include any objects of any sort that can be experienced in any way. Ink marks, plants, animals, rocks, trees, ideas, future possibilities, remembered events, and bodily sensations are all data in this sense. As I gaze out my window, for example, the data of my experience include people and cars, rocks and trees, the breeze against my face, the ideas I am entertaining, and the sensation of my elbow against the table on which I lean. These data are being synthesized or gathered together into the immediacy of my subjectivity. Moreover, I am responding to them, and this response is part of the process through which they are being synthesized. I am responding to the visual image of the cars and people, for example, by in my attention to the people and allowing the cars to recede into the background of my awareness. The way the cars and people come together in my subjective synthesis thus depends, at least in part, on how I respond to them. In process thought it is further suggested that my response, stemming as it does from the active side of my experience, is free. This does not mean that it occurs independently of environmental or biographical influence. The fact that I focus on people rather than cars depends in part on social conditioning and my own personal history. Yet my immediate response is free in that it is actualized by me in the very immediacy of my experience. It is not actualized by other people, or by the cars, or by any of the past influences. It arises de novo as my own self-creation. This suggests that, at the ground of my experience, there is a kind of spontaneity or creativity by virtue of which I respond to the world. In actualizing this creativity, I create my own subjective essence at this moment. My self creates itself in responding to the world. Furthermore, in and amidst my self-creativity lies the possibility of responding to the world in multiple ways. Although I did respond to the cars and people by directing my attention to people, I could have directed it to the cars. Self-creativity implies the possibility of novel responses to given situations. It is just such novelty that one sees in the everyday life of the Zen master, the person who has discovered the creativity of the "true self." The stories of the masters -- where one puts a sandal on his head in response to a question and another shouts "mu" -- are vivid exemplifications of the subjective self-creativity that lies at the ground of their respective selves. Similarly, these masters insist that koans must be answered freely and spontaneously by the student or they will not accept the answers. The masters are not simply encouraging freedom from anxiety. They are encouraging the freedom of novelty. The aim often is to "attain a new and creative Zen personality in order to live freely in this world" (ZCM 162). But the active side of experience -- the realm of subjective doing -- is not all that is emphasized in Zen. So is the receptive side of experience -- the realm of undergoing. To undergo, however, is not to feel burdened. The world that one experiences as given is not felt as an obligation placed on oneself. Instead it is felt as part of oneself. It is something with which one can empathetically identify, because it is part of who one is. As was explained of one Zen master, "the rocks, the river, everything he could see, all this was his True Self" (ZDPR 29). In process terms, the world is the objective content of the subjective self. The data of experience -- rocks, trees, animals, people, etc. -- are part of the world, and yet they are part of the self as well. They are aspects of the universe itself as gathered together into the unity of subjective experience. The self, as whatever one is doing or undergoing, is a concrescence of the universe" (PR 51). The immanence of the objective world in the self can be understood through an example. Imagine talking to a friend. She stands in front of you and thus is external to your body. Yet she is within your experience. Through your visual field, your auditory field, and your field of concern, she is part of you. Your self is thus a field of awareness or a field of feeling which includes seeing, hearing, and caring, plus numerous other modes of experience. It is not, as Descartes would have it, a soul locked within your body and isolated from the world. It is a field of feeling in which other beings are simultaneously apprehended and gathered together into a single whole. It is in this sense that the self is a concrescence of the universe. The insight that the self is a field of feeling or a field of awareness has occurred, not only in Zen or in process thought, but also in twentieth century phenomenology. In Being and Time, for example, the Heideggerian Dasein emerges as a field of concern rather than as an isolated ego. It is noteworthy that Whitehead also uses the word concern to capture the essence of the experiential field (AI 176, 180). Heidegger and Whitehead both see that subjective experience has wrongly been envisioned in past philosophy in terms of models derived from objects of sense-experience. The objects of sense-experience, and in particular those of visual experience, are often passive and bounded in particular regions of space to the exclusion of other regions. One’s experiential field or consciousness, on the other hand, is neither passive nor bounded in one region to the exclusion of others. As will be seen subsequently, the self is centered in the body, but not bounded by it. As a field of feeling or concern, the self is in the body, yet beyond it. In Zen and in process thought, however, the intimacy of the self and world is stressed even more than it is in the phenomenological tradition. While Heidegger’s expression "being-in-the-world" suggests an integral relation between self and world, other aspects of his thought suggest a dichotomy. In particular one does not sense a continuity between Dasein and the world of nonhuman life. In Zen and process thought, by contrast, there is a radical continuity between the self and the natural world, and in two respects. First, the natural world is in the self as its objective content. Trees and rocks are just as much a part of the human self as are other human beings. Second, an ontological continuity is stressed between the human self and nonhuman life. In Buddhist terms, all beings are expressions of the Buddha-nature. In process terms, all beings are expressions of subjective self-creativity. Not only is it the case that the universe is part of the self, it is also the case that the beings in the universe are similar to the self in their ultimate make-up. In each of these ways, a continuity between the self and the world is affirmed. Because in Zen and in process thought the universe is the objective content of the self, it is inappropriate to speak of a boundary between the self and the world. In this way both Zen and process thought transcend the infamous subject-object dichotomy. The transcendence does not involve collapsing the objective world into a figment of the subjective imagination or collapsing subjectivity into a piece of the objective world. Nor does it involve a lapse into pure monism where all particularities, subjective or objective, disappear (ZDPR 15). Instead it involves an assertion (in process thought) and an existential realization (in Zen) that one’s self is at every moment a unification, directly or indirectly, of the universe. The universe itself concresces in and through whatever one is doing or undergoing. As a field of subjectivity in which the world is gathered together, the self is always here-and-now. From a third-person perspective, the word "here" has no particular referent. It can apply to any particular location in one context or another. From a first-person perspective, however, the word "here" refers to wherever one is standing, sitting, or lying down: that is, to the location of one’s body. This does not mean that there is an absolute frame of reference through which to specify the body’s location. Instead it means that one’s body is the frame of reference through which other locations are specified. As Whitehead put it: "A traveler, who has lost his way, should not ask, Where am I? What he really wants to know is, Where are the other places? He has got his own body, but he has lost them" (PR 170). To say that one’s self is "here," then, is ordinarily to say that it is in one’s body, feeling the world. Still the word "in" must be interpreted. From a first-person perspective the self is not "in" one’s body in the same manner that a piece of paper is in a trashcan or that a cup is in a cupboard. These examples point to objects that are in receptacles in such fashion that they are isolated from entities outside the receptacles. By contrast, the self; though in the body, is not isolated from beings outside the body. From a first-person perspective the self is "in" the body in the same sense that one’s visual field is in one’s eyes. As I gaze out my window, my visual field is in my eyes in the sense that my eyes are the locus from which I reach out visually to include the world. Analogously, my self is in my body in the sense that, ordinarily, my body is the locus from which my field of feeling extends outward to include the world. My visual field is simply one aspect of this overall field of feeling. My self; as a field of feeling, is in my body and beyond it. While most lived experience is in the body in the sense just described, a speculative possibility needs to be mentioned for the sake of further clarification of the meaning of the term "here." The possibility is that a self might exist without a body -- for example, in some kind of life-after-death. If this were to happen, what would be the meaning of the term "here"? It would be, I think, that the self would feel its environment (whatever that environment would be and whatever modes of feeling are at work) from some region of what Whitehead called the extensive continuum. Ultimately, then, the word "here" points to a region of this continuum from which the self feels its world. In ordinary human experience this region is coextensive with the body or with some aspect of the body. If a self could exist without a body, however, it would still be "here" from its own perspective. The self never experiences its regional perspective as an object among objects. This is because the self occupies the region, proceeding out from it to form a field of awareness in which the world is contained. As I gaze out my window, for example, I gaze from a particular regional perspective. But this region is not an object among the objects I perceive. It is not this tree, or that rock, or even the totality of visual data. It is the region from which I perceive that totality, a region that my self immediately occupies. I become aware of this region, though, in being aware of the data. Their presence "there" discloses my presence "here." This corresponds to the general principle, made popular in the tradition of nineteenth century German idealism, that self-consciousness occurs in and through other-consciousness. But it is important to remember that the "others" of whom I am aware in self-consciousness are themselves the objective content of my self. Though the trees and rocks are "there" outside my body, they are "here" within my experience. As Whitehead put it: "The world within experience is identical with the world beyond experience. The occasion of experience is within the world and the world is within the occasion" (AI 228). At this point, however, the words "world" and "universe" have been used primarily with reference to the world of spatial perception. It is also the case that the data of temporal awareness are within experience. In remembering the past either consciously or subconsciously, the past is "here" within experience even though its immediacy has perished. And in anticipating possibilities the future is "here" within experience, even though it does not yet exist as actuality. Memory and anticipation are aspects of that field of feeling which is the self; and through these modes of perception the past and future are immanent within the self. The immanence of the past and future in the self does not mean that the past and future are interchangeable. Though some interpreters of Zen might speak of the reversibility of time, I believe that in Zen, as in ordinary life, time is unidirectional. In enlightenment one does not see that the past and future are interchangeable, but rather that they are symmetrically present within one’s field of experience. In Zen time goes one way, though at each point along the way the past and future are symmetrically present in experience through memory and anticipation. The fact that the world of time and space is "here" in experience also means that it is "now" in experience. The word "here" tells us where the self is from its own point of view; the word "now" tells us when it is. The way in which the "now" is understood, however, is crucial. It can be understood either from a third-person perspective or a first-person perspective. From a third -person perspective the "now" has often been pictured as a particularized moment in a series of moments. On one side of this moment stand past moments, and on the other side stand unactualized future moments. From a first-person perspective, however, this picture of particularized now-moments is descriptively inadequate. The now of lived experience is not an object that is felt, but rather the subject that is feeling. It is the process of experiencing the world, not the world experienced. As a process of experiencing, the now is ongoing and ever-present. It is not as if one cannot grasp it. Rather it is the case that one cannot escape it. Wherever one goes, whatever one is doing, one’s field of feeling is now. To say that the self is always here-and-now, then, is to say that it is a process of experiencing which proceeds from a particular region. The word "here" refers to the region, and the word "now" refers to the process of experiencing. The word "always" means that there are no exceptions. Wherever one is, whatever one is experiencing, one is invariably here-and-now. Yet, even as one is invariably here-and-now, one is also always changing. This is the other aspect of what is realized about the self in Zen enlightenment. This fact of perpetual change is what is meant by impermanence in traditional Buddhism. In Zen this traditional doctrine applies even to the true self. The true self does not transcend time, but rather lives time from the inside. From a third-person perspective it is easy to picture the manner in which the true self is constantly changing. Recall the image of a swimmer swimming the length of a pool. The "person" is represented by the series of strokes from one end of the pool to the other. Each "subject" is represented by a particular stroke. And the "self’ is represented by that particular stroke which, in the ongoing life-history of the person, is immediately occurring. While each subject is in a sense stationary by virtue of the fact that it occupies a particular region of the pool, the self traverses the length of the pool as one subject and then another, moving from region to region. Thus the self is different at every moment and yet invariably here-and-now. From a first-person perspective, however, the self’s change does not lie in the fact that it moves from region to region. Its change is not necessarily that of bodily position. For example, one may stay in the same region of space for a given period of time, and yet be feeling and thinking different things at each moment. The impermanence of the self lies in the subjective process of experiencing (the "now") whether there is or is not a change in bodily location (the "here"). Even in meditation this subjective change is occurring, though not in the form of rapidly shifting thoughts and conscious feelings. Rather it is occurring in bodily feelings, the feeling of breathing, for example. Meditational experiences involve timelessness only in the sense that ordinary temporal transitions, discernible through shifting thoughts and momentary feelings, are transcended. Deeper temporal transitions, in particular those involved with bodily experience, continue. In ordinary experience, there are four ways in which the transitions of the self are disclosed. In the first place, they are disclosed through sense-perception. As objects in one’s visual field move through space, for example, one’s feeling of them changes. This is because feelings of visual and other sensory objects ordinarily involve a sense of where they are spatially, and their locations are in constant flux. A second way in which the transitions of the self are disclosed is through the memory of past subjective experiences. In such memory one recognizes a difference between then and now, and one thus sees that a transition in the nature of the self has occurred. A third way is through anticipation. Whereas memory discloses transitions that have taken place, anticipation discloses transitions that may take place in the future. I anticipate the completion of a paragraph, for example, and thus discover the possibility of new content to my self in the future. Yet there is a fourth way in which the transitions of the self are disclosed, a way that is more perspicuous than sense-perception, memory, or anticipation. This is through the activity of making decisions. At a conscious or subconscious level, suggests Whitehead, we are always deciding how to think, feel, or act in response to the data of our experience. Examples from consciousness are manifold. When I see a book on a table, I respond either by deciding to take further note of it because it seems interesting or by deciding to dismiss it from my immediate attention. When I hear the telephone ring, I respond by deciding either to answer it or let it ring. When I think of a word to use in conversation, I respond by deciding either to use it or not. In the latter example the reality of subconscious decision comes into purview, for much speech involves making subconscious decisions either to use or not to use certain words. The point is that at all times -- either on a conscious or subconscious level -- the self is experiencing and deciding upon possibilities for thought, feeling, and action. This is the truth so well articulated in the literature of existentialism: namely that we are condemned to freedom; we cannot choose not to choose. The activity of choosing or making decisions that is occurring in one’s life is the reality of self-creativity mentioned in the first section of this paper. At every moment the self is creating itself by making a decision as to how to respond to the data of its experience. It is this self-creativity that is uncovered so vividly in the Zen enlightenment experience and that is then highlighted in the Zen way of experiencing. In Zen it is realized not that one may or may not decide to respond to the world, but rather that of necessity one responds to the world. For the deepest aspect of one’s life -- the true self -- is identical with this response. Inasmuch as the self is always in the process of deciding, it is always coming-into-being. In this sense one is always on the way toward the actualization of some possibility for thought, feeling, or action. It is also the case, however, that the self is always passing-out-of-being. From a first-person perspective this passing out of being is not experienced as the passing of a fleeting now-moment. Instead it is experienced as the activity of creating a personal past, the immediacy of which can never be retrieved. To respond to the data of experience is to create a personal fact which becomes part of the past, never to be relived. Thus the self is perpetually perishing, to use Whitehead’s phrase, even as it is perpetually creating itself. It is simultaneously a process of dying and living at each moment. The fact that the self is always living and dying gives it a peculiar ontological status. In traditional Buddhist terminology, it neither is nor is not. In Whiteheadian terminology, it becomes, but "never really is" (PR 82). One way to capture this ontological status is to speak of the self as a "process," both in Whitehead’s sense of concrescence (coming-into-being) and transition (the perishing of immediacy). The self, then, is not a being in the sense of being a static fact, nor is it mere nothingness. It is pure subjective becoming, pure process, that is perpetually perishing in the midst of its becoming. The key to Zen Buddhism lies not in escaping this process, but rather in living it fully. Ultimately, of course, one has no choice except to live the process fully, for the process is one’s own life. What happens in Zen enlightenment, however, is that this perpetual process of living and dying -- the everyday mind -- becomes the lived point of departure for all activity in the world. The enlightened Buddhist discovers that she need not cling to the past or the future, because she is always here-and-now. And she discovers that she cannot cling to her life; she can only live it fully, because she is constantly changing. ZCM -- Zenkei Shibayama. Zen Comments on the Mumonkan. New York: Harper and Row, 1975. ZDPR -- Anne Bancroft. 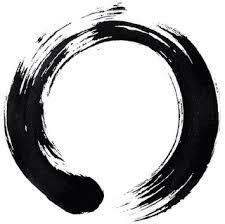 Zen: Direct Pointing to Reality. New York: Thames and Hudson, 1979. A few years ago I caught a glimpse of the non-dual interdependence of all things and events caught in the field of space-time while hiking alone on the northern coast of the Olympic Peninsula in Washington State. I followed a game trail through opaque, self-concealing forest that broke onto a boulder-and driftwood-covered beach. It was an old trail, mostly taken over by deer on their way to a nearby creek that emptied onto the beach. Old-growth western hemlock, Douglas fir, and red cedar loomed overhead from a floor matted with feathery moss, as if pulled up by invisible wires into the coast fog. In this rain forest, it’s always dark and wet, even in summer.